- Create your own cycling team, start from scratch, set your goals and reach them. - Manage your team through tough seasons, gain success and win the biggest tours in the world. - Compete with teams from all over the world - all aiming to become number one. Test your management abilities as a cycling manager of your own cycling team and reach your dreams. Design tactics, train riders, buy and adjust the perfect equipment and make your way as the best cycling manager in the world. Join today and become a part of the unique and friendly Cycling Simulator - Online Cycling Manager community. 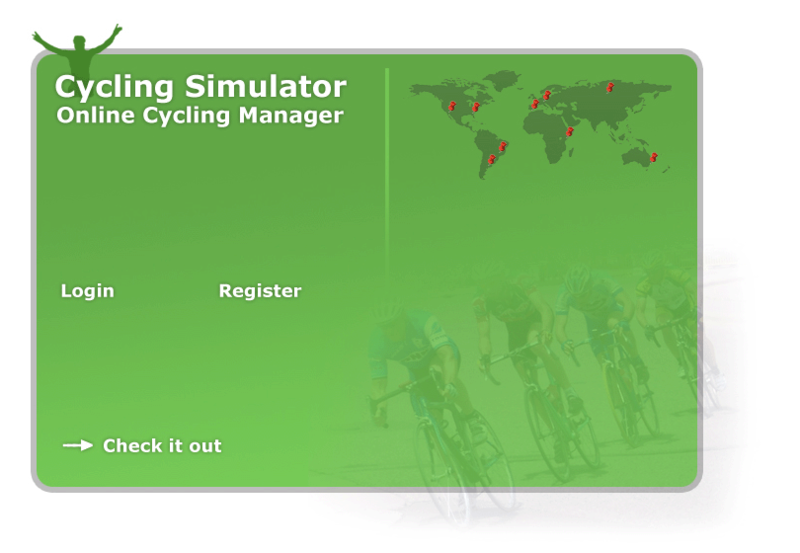 Play with 831 other cycling managers from all over the world. The name of the manager of the team. Used for activation. Only visible to the site admin. Personal data stays at all time with Cycling Simulator alone. The only information stored about users that is not provided by the users themselves is IP and hardware information available through the browser. Please notice that the forums and the site in general is mostly open to unregistered users who'll be able to view basic team information such as manager name as well as any forum contribution. E-mail addresses registered at Cycling Simulator will never be passed on to any third party companies or persons.